A "New Home" for Nunc and pals! The vicar, the Sunday School children and all the congregation are delighted to have officially received St Hilary's church new eagle lectern (carved out of solid brass!) and gold leaf bible. However they are NOT the only ones who are also delighted to have this new addition. 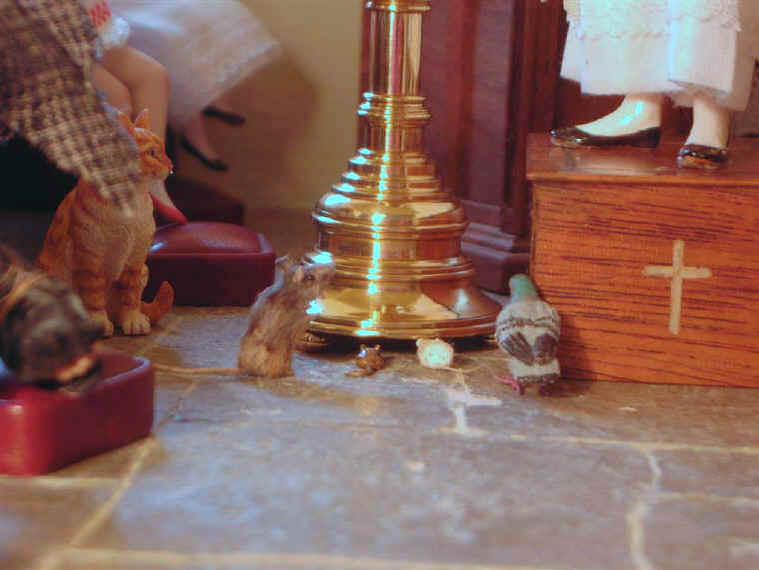 Would you believe that Nunc Dimittis the mouse and his other mouse friend, Snowy, think that this is THEIR new home! Take a close look at this photograph here. 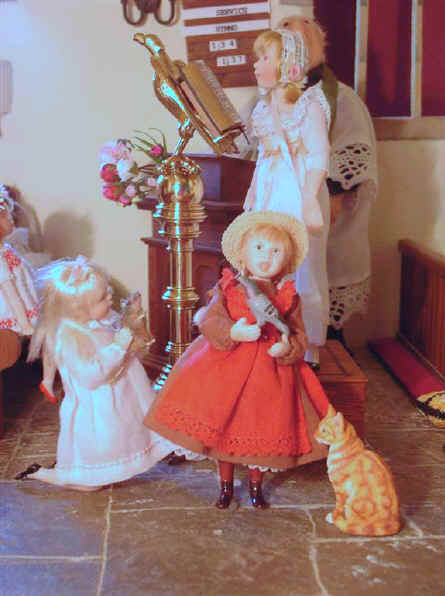 Although you can see Alice proudly standing on the new box as she reads from this new brass eagle lectern, Nunc, the mouse and his friend, Snowy are not far away are they? 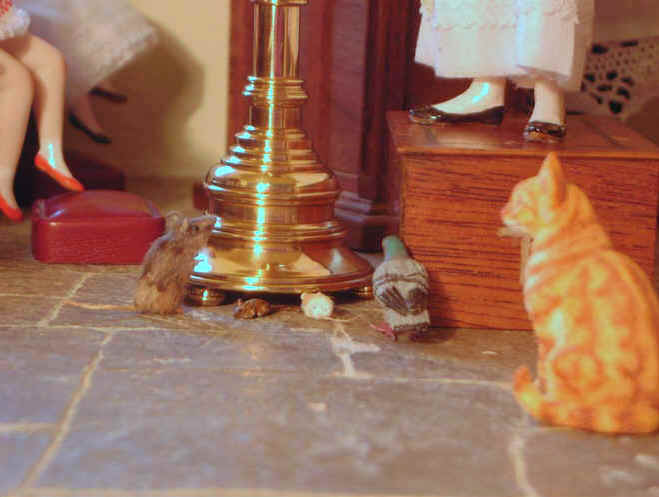 Sepp, the rat and Syd the pigeon, both friends of Homer, have joined Nunc Dimittis and his fellow friend Snowy. 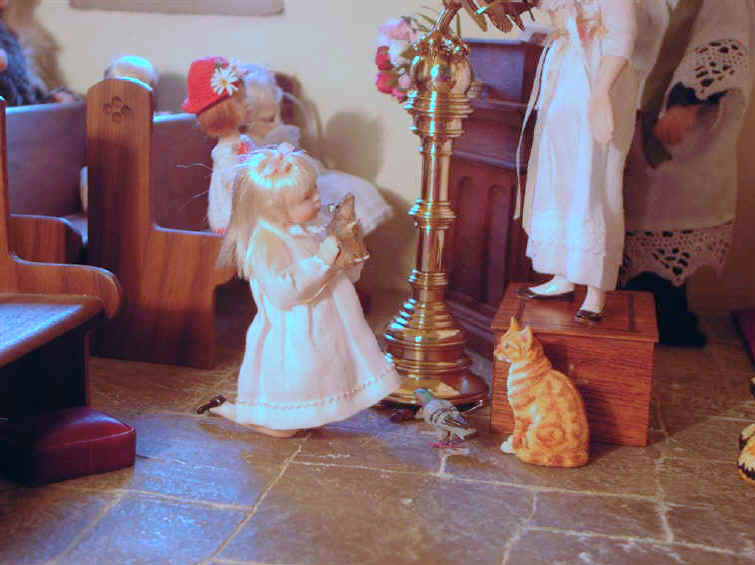 Both Nunc Dimittis and Snowy are running as quickly as they can to hide from Magnifi-Cat the church cat. We hope that they hide in time because Magnifi-Cat has got his beady eye on them hasn't he? Poor Sepp and Syd! They are SO jealous of Nunc and Snowy. You can see why can't you?. They are too big to hide under the feet of the new splendid eagle lectern. We hope that Magnifi-Cat is too interested watching and waiting for Nunc and his friend Snowy to come back out from under the eagle lectern to notice them! Oh dear! As you can see Nunc is peeping out from under the lectern to see if Magnifi-Cat has given up waiting for him! Unfortunately he has not. Instead Magnifi-Cat has decided to wander over to the other side of the lectern to wait for them both. Poor Snowy! He nearly got caught didn't he after venturing out ahead of Nunc. We hope that both mice hide again in time! HOW lucky is that?!!! 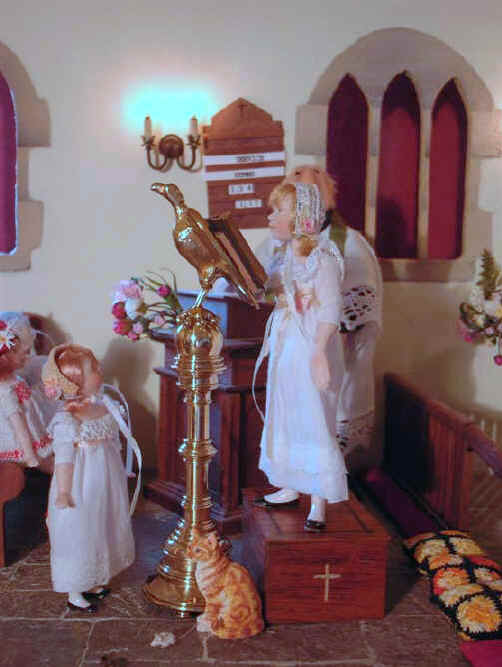 Dear Priscilla Jane has noticed poor Sepp the rat was in danger after not being able to follow the mice under the eagle lectern. She has whipped him up in the nick of time. However we are still VERY worried about Syd, the pigeon. Will any other of the children notice he is in danger too from Magnifi-Cat?! Phew!! Thank goodness for that! Adele must have been watching Syd the pigeon and made sure that he was out of danger from Magnifi-Cat the cat just in time. Of course WE know that pigeons can fly away from danger but Syd is a VERY lazy pigeon who has forgotten how to fly today! The children have learnt in their Sunday School lessons that God loves and cares for them all of their lives. Therefore they want all of their church pets to know that they too, like God, love and care for them. They always look out for them when they are in any kind of danger and rescue them whatever else they may be doing at the time..
Did you know that the "Magnificat" was actually the words that the Virgin Mary spoke about her unborn son and Son of God, Jesus Christ when she visited cousin Elizabeth who was also expecting John the Baptist. The "Nunc Dimittis" was spoken by Simeon when the child Jesus was presented in the Temple. Our lectern has been made out of solid brass especially for us by John Cheal and more information on this most amazing acquisition can be found on our News page.